Powel Crosley Jr. from Cincinnati, Ohio pictured with the wireless, crystal radio set that he perfected and manufactured, 1938. 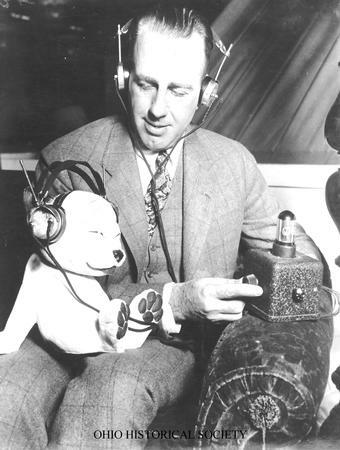 The stuffed toy dog on his lap was a company mascot known as the 'Crosley Pup'. Beginning in the 1920s, Cincinnati businessman Powel Crosley, Jr., ventured into radio broadcasting, establishing WLW, a Cincinnati radio station. He increased the station�s broadcasting power to 500,000 watts, making it the most powerful station in the world. Supposedly, the station was so strong that people could actually hear broadcasts through the gutters on their homes. During World War II, the federal government utilized Crosley�s station to broadcast the Voice of America all over the world. Eventually, the Federal Communications Commission reduced the maximum wattage for radio stations to fifty thousand watts. WLW was the first station belonging to the Crosley Broadcasting Corporation. Numerous radio stations eventually belonged to this corporation. At the end of World War II, the Aviation Company purchased the Crosley Broadcasting Corporation, but the new firm retained the Crosley name. During the 1950s and 1960s, the Crosley Broadcasting Corporation ventured into television. The company broadcast its own shows, but, eventually, many of these programs became staples of the National Broadcasting Company (NBC). Perhaps the two most famous programs developed by the Crosley Broadcasting Corporation were The Phil Donahue Show and The Jerry Springer Show. In 1995, Gannett purchased the Aviation Company, which had changed its name to Multimedia in 1976. By 1997, Gannett had sold all parts of the Crosley Broadcasting Corporation to other businesses. At its peak, the Crosley Broadcasting Corporation operated at least four AM radio stations, five FM radio stations, and six television stations.